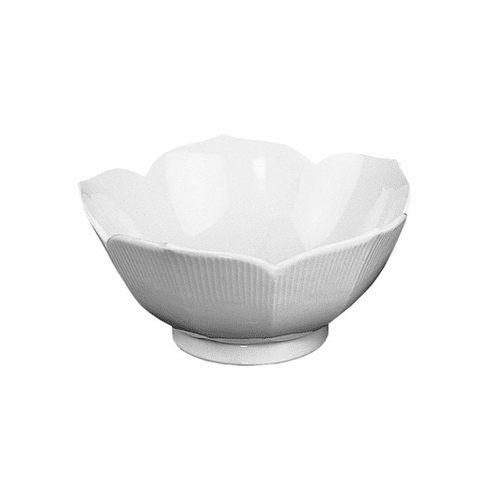 Home > Kitchenware > Tableware > Porcelain Lotus Bowl 4.5"
Beautiful whitewares are versatile. They go with any dcor and they spotlight your culinary creations. When you spend so much time preparing attractive and colorful dinners dont lose them to pattern and color place a lovely Salmon with wild rice and asparagus on blue plate with a huckleberry print and youre sure to stifle the delight and wonder of your well thought out and prepared dinner. Frame your food with beautiful whiteware and put the spotlight on dinner. HICs porcelain, 4.5 Lotus Bowl will do just that. It is made of porcelain, but dont let that scare you, because this bowl is extremely durable. Take it with you, wherever you want and need it. This bowl is oven, microwave, freezer and dishwasher safe. Bring your culinary masterpiece from the kitchen to the table and your guests will see it a work of art beautifully framed in HIC porcelain. 8 ounce capacity.